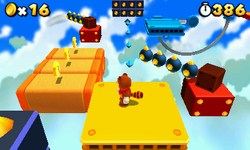 World 5-3 is the third level of Super Mario 3D Land's World 5. The level is a sky level with several moving platforms. This level is unlocked by collecting forty Star Medals. Mario lands in a platform where is leaned a rail board, after a single Flophopper. In this ride, Mario crosses Donut Lifts, spiked bars and spiked cubes, until he reaches in a blue swinging engine that leads to a stationary platform with some blocks and a Flophopper. On the right, Mario will ride two moving platforms, crossing Paragoombas, Fire Piranha Plants, more Donut Lifts and spiked cubes. In the end of the rails, Mario must go up on a big platform, where three Flophoppers are faced. In the end of this platform, the plumber finds a Checkpoint Flag and Donut Lifts with Paragoombas, that lead to two swinging platforms. The last one takes Mario to four platforms circling spiked blocks and under a ? Block with a Super Mushroom or Fire Flower. Going up on an iron floating area, Mario encounters many Flophoppers, a pole that leads to a Rainbow Jump Block and three Donut Lifts, conducting to two moving boards that, besides going ahead, also go up or down. After crossing many falling blocks and spiked obstacles, he will find two platforms. Between them, a swinging platform and on the last, the Goal Pole. Star Medal 1: After passing the checkpoint, the first medal can be easily obtained by jumping over the block with the first swinging platform. Star Medal 2: Shortly after the swing platforms, the player should come to an area with Flophoppers and a pole. Climbing up to the top of the pole will take the player to a Rainbow Music Block. Jumping on the block will take the player to a Coin Heaven area that contains the second Star Medal. Star Medal 3: After taking the Rainbow Block, the player will find themselves on one final set of moving platforms. They should stay on the left platform while avoiding the hazards, as it will take them to the Star Medal.